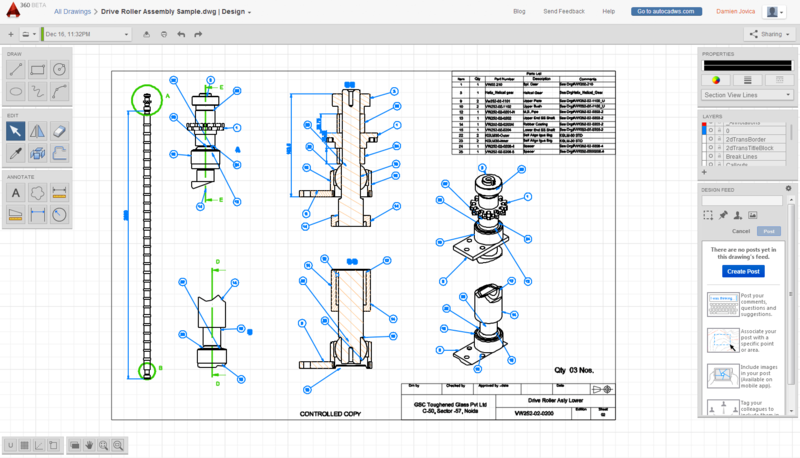 Autodesk lead the way in Cloud-Based CAD Solutions. In today’s world where projects needed to be completed last week, AutoCAD 360 is a handy tool for any CAD user that needs to communicate and design at the speed of business. The industry has been screaming for an access anywhere, anytime CAD system for years now and while other CAD vendors have been dragging their feet, struggling to release mobile viewer apps with markup let alone a CAD system, Autodesk is pioneering CAD portability and capturing this growing market segment. 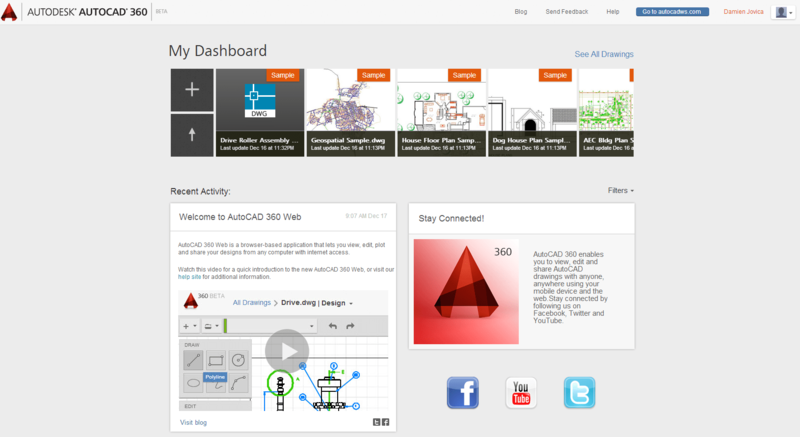 AutoCAD 360 is Autodesk’s second Cloud-Based CAD offering packed with features. Ironically, Autodesk released a 3D CAD system (Fusion 360) for the cloud before they released AutoCAD 360, but you can see why. Fusion 360 was built from the ground up where AutoCAD was already a standalone product. It’s like a blend of AutoCAD, LinkedIn, Dropbox with some other unique functions. It has the main functionality of AutoCAD as you can see in the screen capture for design and detailing. The dashboard has links to your data, recent activity and feeds. The beauty of 360 is that you can access data, collaborate, view and edit in real-time from any device. At this stage it has only 2D CAD functionality but you can open 3D DWG’s, so hopefully future versions will have more 3D functionality. Data is accessed by linking your cloud storage service to AutoCAd 360. It supports Autodesk Buzzsaw, Box, Dropbox and Egnyte or you can assign another WebDAV provider. You can share your files with two groups; collaborators and reviewers. There is a Design Feed function that you can post ideas and associate the post to areas of the design and add people to the post too, keeping them informed. If you need data locally you can download the files in DWG & DXF or send it to the printer. Other benefits to running a cloud based CAD system is negating the requirement for high-end computing, thus reducing company costs in two ways, capital expenditure and energy, with the flow on benefits of reduced energy being sustainability and reduce carbon emissions. I.T. love it too because there is no deployment required either, so it saves time which also leads to saving money, and while we’re on money, the cost of a cloud based CAD system is lower than the local machine version too. All in all it is a great start for the first AutoCAD 360 release and I look forward to how they keep pioneering into the cloud with CAD. It’s all about the right tool for the right job. As the last generation of CAD users retire and today’s tech savvy, social media engineers lead the way, Autodesk is catering for their requirements.